Built in 76 by Herb Tremain, Black Fun went on to win the 1976 NZ QT Cup with 4 straight wins. Black Fun is built of glass over foam on ply frames and was fitted with a custom bulb keel weighing in at 220kg in 1999. 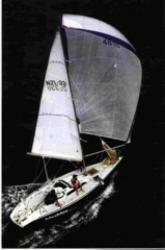 She has an over-size rig and runs masthead kites from the Ross 930 class. Now in the UK.